Other mistake: The text of the German news is wrong. It is titled "Fensterputzer halten an ihrem Lebemfest" (Window cleaners hold on for their lives). It should be "Leben fest". Also "Newsdirek" is wrong, it should be "Newsdirekt" or better "News direkt." 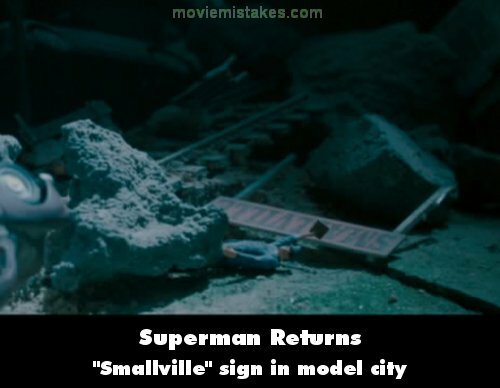 Revealing mistake: Just before the end credits, as Superman is flying past Metropolis and into space, watch the car headlights in the background. The background shot is blatantly sped-up by a large amount, as all of the cars appear to be travelling at huge speeds, even in a traffic jam. Suggested correction: Queensland radio stations don't start with qld. All radio stations in Queensland start with the number 4. The word on the radio would have been "old"
Continuity mistake: In the sequence with the kryptonite continent, Superman plunges under water, when he comes back up, his hair is soaked, then throughout the next few shots, it switches back and forth of being out of place and being "super" hair. Continuity mistake: In the scene when Superman is entering the baseball stadium from above holding the 'plane, we see a quick shot looking down from above the 'plane. The field is empty of players. Continuity mistake: Before the earthquake, the radio in Ma Kent's changes positions between shots, and a table cloth appears under Ma Kent's reading glasses. Other mistake: In the credits, just before the listings for the transportation crews, "Post production" is misspelled as "Post Poduction". Visible crew/equipment: In the scene where Martha Kent investigates the crystal ship, there is a fuzzy outline of a crew member behind the truck. 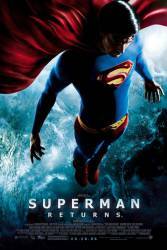 Continuity mistake: When Superman is flying over the sea trying to locate Lois, his hair is fluffy. He suddenly stops and there's a brusque cut where a close-up of him shows his hair brushed and perfect. Continuity mistake: In the scene where Lois and Jason are going to the hospital to visit Superman, Jason's hair is wet outside as they are walking toward the hospital. Once inside however, his hair is dry.